TOUCH OF CREATION: Fabulous !!! 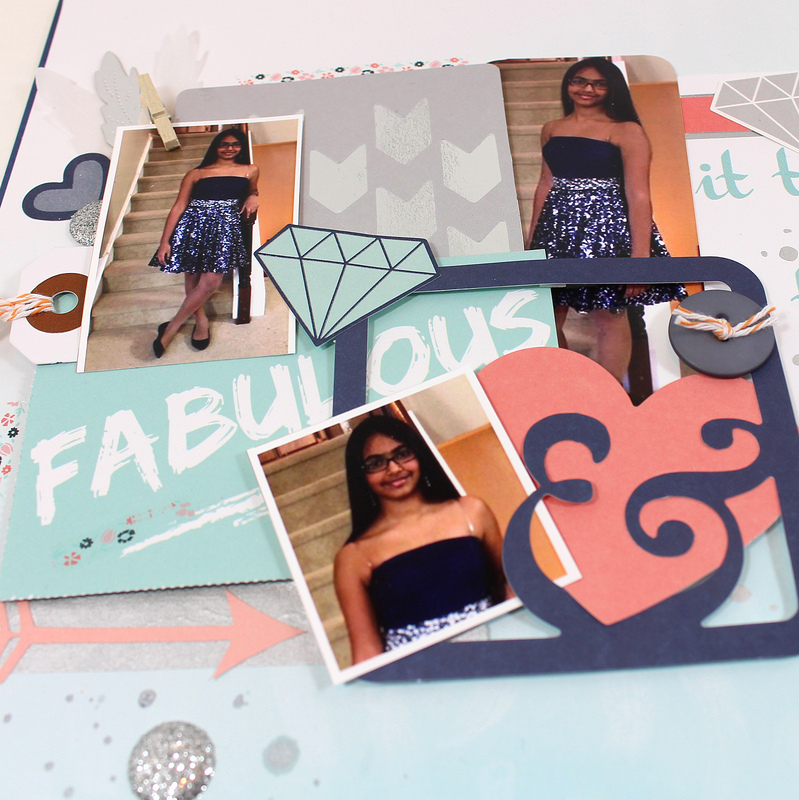 Today I'm sharing a layout using Forever Sassy scrapbooking kit over at SEI Lifestyle blog. This collection is absolutely gorgeous!!! I also used some Silver Foil cardstock and Silver Washi tape . Die-cut overlays are fabulous...they come in variety of styles , perfect for any layouts or cards. I used the Perforated sheet for my title ...love the prints! The sticker sheet has lots trendy icons as Gems, feathers, arrows and more. Kit also includes vellum sheet...I used it to die cut some feathers using Top Dog Dies- Feather dies. The most fun thing in the kit is the decorative tape runner!!! I love it! Super easy to use and looks amazing!! You can find the entire Kit HERE. This layout is for the following challenges..
All Crafts Challenge - Anything but card. Simon Says Stamp Challenge: Special lady/girly. Crafty Boots - Anything but card. Eureka Stamps - Anything but card. Gorgeous layout Piali, I love the colours you have used. Thank you for sharing you work with all of us at Crafty Boots Challenges. Oh, how FUN is this?! !...Totally, LOVE it! Great page. Love how you have brought all the elements together to showcase your photo's. Thanks for joining in at Crafty Boots Challenges this time. hello Piali! awesome photos, she is beautiful...luv the page and the perfect title! I am thrilled you played along with Simon Says Stamp Wednesday Challenge! What a beautiful layout! Thanks for joining us this week at Eureka Stamps for our "anything but a card" challenge. Hope to see you again soon! Thanks for join us at Crafty my Life challenge. March 2012. **** July 2012. STAMP IT CARDS- Love challenge. DCWV- Tombow USA Blog Hop!! All content, including text and photos © Piali Biswas; All rights reserved. My artwork on here is for personal inspiration and enjoyment only and may not be copied for submission to contests, publications, or design team submissions. Enjoy! Thanks so much for your support! Copyright.Piali Biswas. Awesome Inc. theme. Powered by Blogger.